Jazz in the Garden: Every Friday evening throughout the summer, rain or shine, the National Gallery of Art offers free jazz performances in the Sculpture Garden. You are welcome to bring your own picnic dinner or purchase food at the café. Live music is from 5:00 – 8:30 p.m. The nearest Metro stations are Archives/Navy Memorial, Smithsonian and Judiciary Square. Eastern Market: Located in the Capitol Hill neighborhood, Eastern Market has everything from beautiful jewelry and crafts to fresh fish and local farm-grown veggies. Eastern Market is DC's oldest continually operated fresh food public marketplace. Get some friends together and take a walk around—you can sample the delicious Honey Crisp apples and gourmet cheeses! Museums: One of the best things about DC is that it is full of free museums! 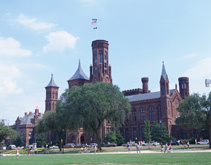 All of the Smithsonian museums located along the National Mall are open to the public free of charge, including the National Archives, the Air and Space Museum and the Museum of Natural History. The National Gem and Mineral Collection at the Museum of Natural History is home to many rare and famous minerals and gems, including the stunning Hope Diamond. Paddle the Tidal Basin: For $6 each, you and a friend can rent a paddleboat and float through the basin. The paddleboats are a spectacular way to catch some rays and take in the scenic views of the surrounding gorgeous Japanese Cherry Trees and the Jefferson Memorial. Monuments by Night: The majority of DC visitors will go to the memorials and monuments during the day. Walking through them at night is a completely different experience altogether. The monuments are lit up, revealing glowing reflections and shadows—a whole new serene perspective on the city. Most are open to the public with rangers on duty until 11:30 p.m.